Pictured, from left to right, are Corey Hopson, Rickie Limoges, William Smith, Phillip Wood, and Kathleen Dennison, the first cohort of graduates from VSU’s MAT in music education degree program. 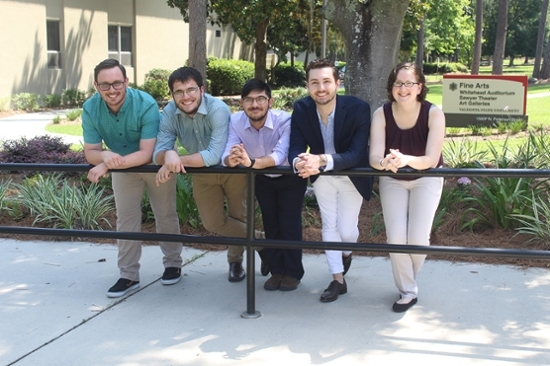 VALDOSTA — Five graduate students recently became the first to earn a Master of Arts in Teaching (MAT) in music education from Valdosta State University, and they celebrated their July graduation with a 100 percent job placement rate. The MAT in music education degree program is a one-year, four-semester program that is accredited by the National Association of Schools of Music and the Georgia Professional Standards Commission. It provides students pedagogy and necessary skills to perform as teachers in the P-12 environment; prepares students to document and assess student learning outcomes and to be conversant with innovative practices within the field; and produces graduates with exceptional content knowledge and pedagogical expertise who will engage, inspire, and educate P-12 students. (GACE) and the national edTPA (Educative Teacher Performance Assessment) exam and are entering the workforce with T-5 teaching certifications issued by the Georgia Professional Standards Commission. “I am very proud of myself and the rest of the graduates for all of our hard work, determination, and dedication,” said Phillip Wood, a native of Belton, South Carolina, who is a vocalist and saxophonist. He is the new director of choral activities at Robert Anderson Middle School in Anderson, South Carolina, and will teach all of the choirs and direct the school’s spring musical. He will also serve as the woodwind instructor for the Westside High School Marching Band. Kathleen Dennison, a native of Lilburn, Georgia, who earned a Bachelor of Arts in music education in 2017 from VSU, said one highlight of the MAT in music education program was the experiential learning opportunities. Dennison is the new middle school band director and music teacher at Pelham City Middle School and Elementary School in Pelham, Georgia. She will teach middle school band and fourth and fifth grade general music. She will also assist with the high school marching band. Corey Hopson, a native of Bishop, Georgia, who earned a Bachelor of Arts in music from VSU in 2017 before entering the MAT in music education program, is the new band director at Coffee County Middle School in Douglas, Georgia. Hopson, who plays all brass instruments as well as the saxophone and bassoon, will also assist the high school during marching band season. Other graduates of the MAT in music education program are Rickie Limoges, the new assistant director of bands for Lanier County Schools, and William Smith, the new director of bands for Lee County Middle School West. Contact Dr. Doug Farwell at (229) 333-5804 or dfarwell@valdosta.edu to learn more.